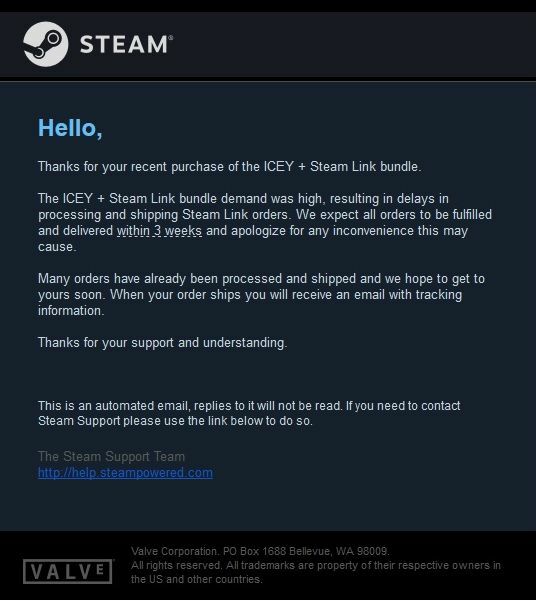 An email sent out to those that took advantage of the bundle warns of potential three-week delays. Just last week, Valve marked the price of their Steam Link down to $1 in a bundle that paired the streaming device with 2D action-adventure Icey. With shipping bringing the bundle to around $15, it's certainly a steal for a device with a standard price of $49.99. Sadly, those that took advantage may have to wait a little while before their hardware arrives. So, put the Steam Link out of mind for a little while. There are more Steam sales around the corner anyway, with the Halloween sale going down tomorrow. Guess I got in on this early. Mine arrived today.